It's finally here. The madness began on Thursday, and the first round of the 2019 NCAA Tournament is off and running again on Friday. We have not seen a No. 1 seed fall to a No. 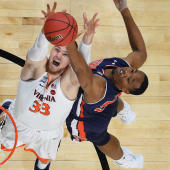 16 seed like last season -- at least not yet -- but between Ja Morant taking the day by storm with the first triple-double in The Big Dance since 2012 and a wild Auburn-New Mexico State ending that left Bruce Pearl nearly speechless, there was no shortage of excitement to get your Thursday thirst for college basketball quenched. Now we're onto day two. Three No. 1 seeds will play their first game on Friday -- including No. 1 overall seed Duke. Plus, No. 2 seed Tennessee takes on No. 15 seed Colgate and No. 6 seed Buffalo battles wth No. 11 seed Arizona State. The action tips at 12:15 p.m. ET with No. 7 seed Cincinnati and No. 10 seed Iowa. Before we all dive head first, let's first take a look at how you can watch the games. Below is all the information you need to catch the Friday first round March Madness action from start to finish, including how you can stream each game while on the go.